You will get a mention on Copylove.cc. You will get our acknowledgement and thanks on the website and material we publish, which you will receive via email. We will also send you a Copylove badge and sticker. In addition to our thanks, acknowledgement on the website and materials, a Copylove badge and a sticker, you will get a publication about Copylove from the perspective of artist Efrén Álvarez. We will also email you the resultant digital publication. By contributing this amount, you will receive an exclusive t-shirt, illustrated by Efrén Álvarez, as well as the published materials, a sticker, a badge, our sincere thanks and public acknowledgement on the webiste and digital materials. With this contribution, you will receive 3 issues of the magazine ESETÉ, published by AMASTÉ, and KIT-KRAK's printed map, as well as the exclusive t-shirt with illustrations by Efrén Álvarez, the journal, the t-shirt, the badge, you will be mentioned in the acknowledgements and we will email you the resultant publication. With this contribution you will get "Creación e Inteligencia Colectiva" or "Código Fuente: La remezcla" published by ZEMOS98, the DVD "La Escuela Expandida" and the exclusive t-shirt by Efrén Álvarez. And of course the journal, badge, and sticker. You will get a mention in the acknowledgements and will receive the publication on your email account. A reward designed for collectives or communities. 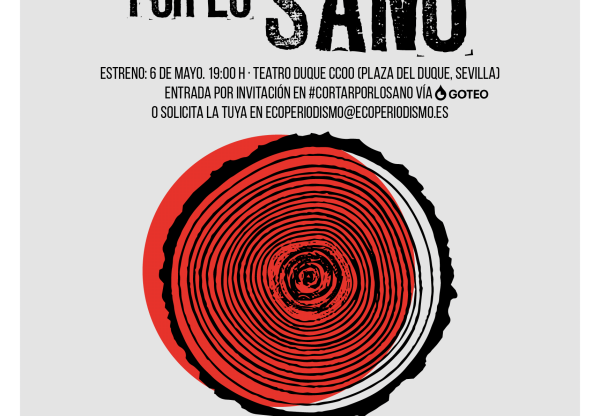 In addition to 2 Copylove sets (t-shirt + journal + sticker + badge), we will send a package of ZEMOS98 publications (2 books and the DVD Educación Expandida) and a ColaBoraBora set (5 issues of the ESETÉ magazine and KIT-KRAK printed map Prototipos para el Cambio). We will present to you the conclusions of our research in a short-format workshop (only 4 hours long), where we will bring our ideas together to go on working on them. 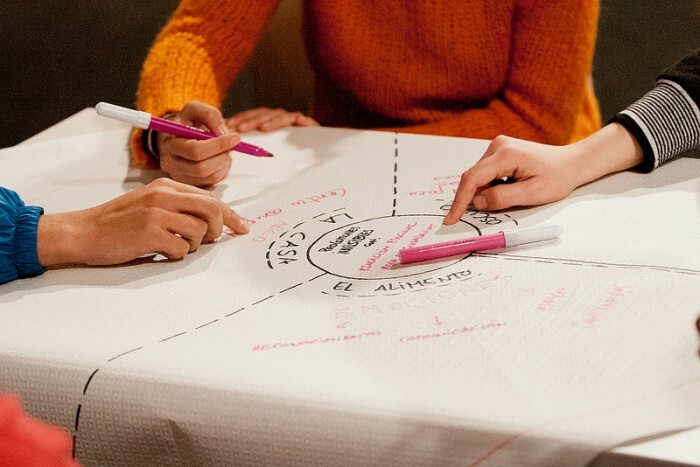 It will not be a 4 hour chat: we will activate some of the lines and concepts that come out during the workshop. A member of our team will conduct the workshop. Travel and accommodation are not included. This reward is perfect for conferences, workshops, collectives, meetings… We will also bring 10 Copylove packages (journal + sticker + badge). Your logo will be shown at the bottom of the website and publications, and you will receive 5 Copylove sets (journal + sticker + badge) and the digital materials. A COPYLOVE residence means working with the local community and all the work prior to it. This shortened version, of 2 days, will serve to share the conclusions and activate working groups which will develop and move along COPYLOVE's lines of work. With this reward, we will do some specific work in your community. Travel expenses, accommodation and meals for three people (from Sevilla, Barcelona and Bilbao) are not included. 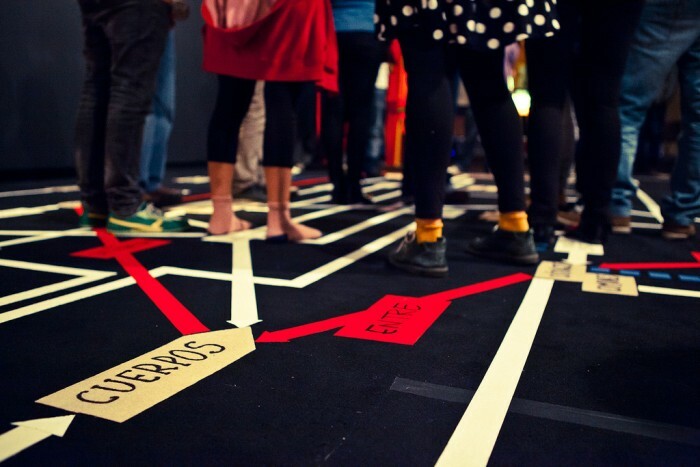 This reward is designed for cultural centres in general, institutions and spaces with the intent to activate, think and rethink their communities. Also included are 10 Copylove sets (journal + sticker + badge), and acknowledgements on the website and publications. To pay 3 part-time workdays (worth 600 Euros) for 3 months. This includes collectively revising the project's archive, sorting and conceptualising the archive (taxonomy), writing new texts, managing, mailing correspondence, performing administrative tasks related to hiring, salaries and monitoring the budget, updating the web with contents, videos and documents, as well as performing communication and promotion tasks. To pay fees for the design and layout of a template for PDF documents. To perform the same tasks for 2 months. To deliver the rewards within Spain by standard mail. To mail with the individual rewards and to use as gifts in packages and events. To make an exclusive t-shirt designed by Efrén Álvarez with illustrations from the Copylove Ontology. Copylove is a firsthand investigation in which we try to extract, from the experiences we had, what kind of ties and relations are established within a community of agents, whose practices and ways of doing generate commons for the whole community. Copylove is a way of getting deeper into all that we consider that reproduces desirable conditions of existence: affection, processes of interdependence, mutual aid, community love, care. When we say Copylove, we mean everything we produce and reproduce that can take us closer to "good living", to a sustainable living, and not simply in monetary terms. We are closing the first stage of the project and, by means of this crowdfunding campaign, we aim to create an accessible publication (hosted at www.copylove.cc), which would enable others to apply Copylove in other contexts. 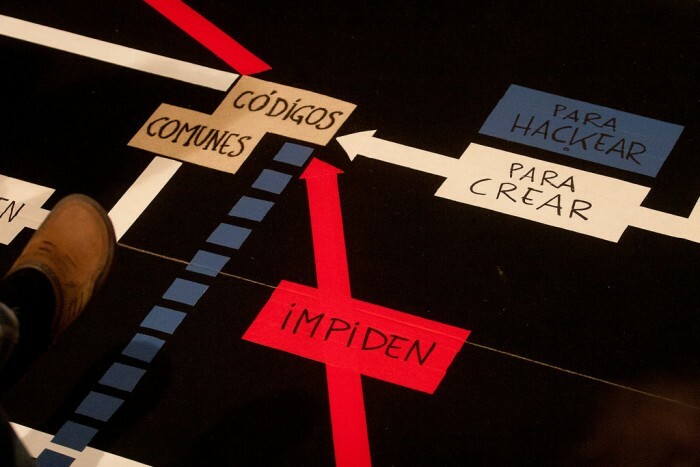 Moreover, this systematization of the contents and methodologies designed during the last three years will allow us to imagine new developments that might be useful for the commons. 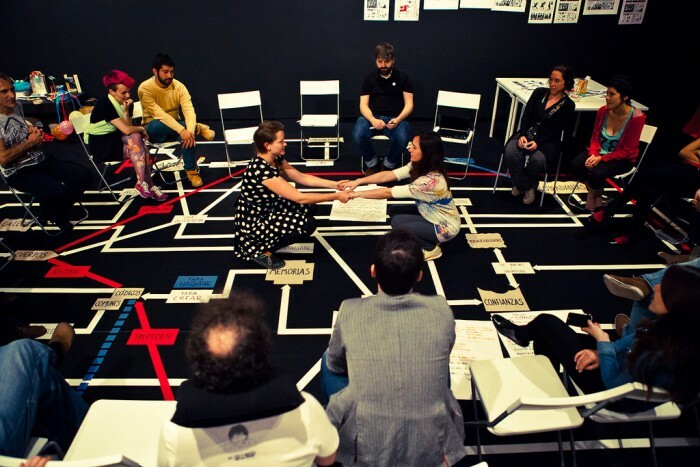 Copylove started as a local and informal research network to research on commons and feminist practices. That local community established the framework for an open and public research: "The Ontology of Copylove", a related concept map that we use as our game board. 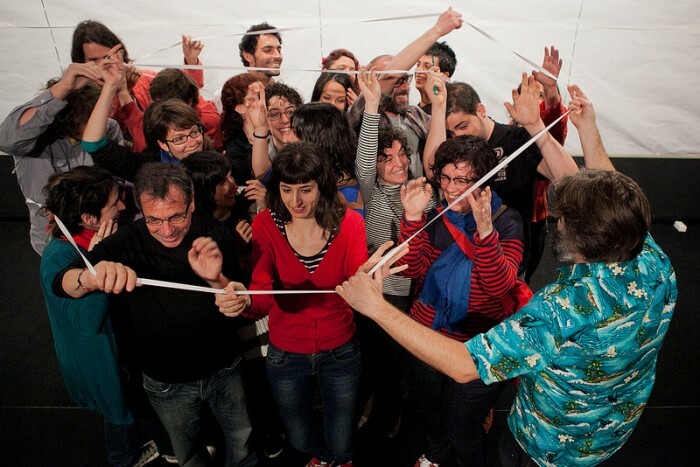 Sofia Coca (from ZEMOS98, Sevilla), Txelu Balboa (ColaBoraBora, Bilbao) and Rubén Martínez (ZZZINC, Barcelona) co-direct the project nowadays. 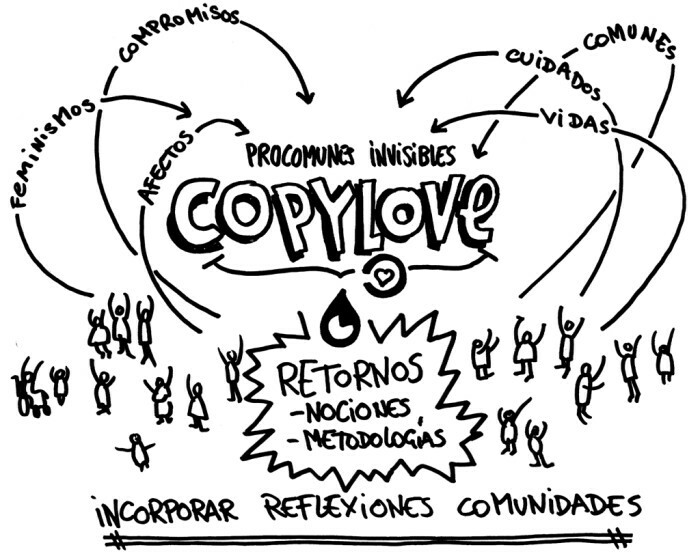 From year 2011 on, Copylove has given value to spaces of co-research not centred on logocentrism, through the so called Residences (held in Sevilla, during the Encuentros de Verano de UNIA -Universidad Internacional de Andalucía’s summer courses-, and in Museo Reina Sofia in Madrid). These residences have been the best way to test and formulate work hypothesis and, above all, to collect qualitative data within communities from several territories of the Spanish state. This year 2013, we have created a website, www.copylove.cc, where all contributions are collected in raw, in the shape of videos, outlines and diagrams, methodological developments, reviews, etc. Copylove has always been an open research, but now we need time to build and refine the concepts, relations and eventual drifts of this project. We feel there is an informal community surrounding the concept and we launch this crowdfunding campaign with the aim of giving useful tools in return to said community, which would enable anyone to keep on using and enriching the concept of Copylove. This work on commons, feminist economics and current democratic processes does not want to be constrained to the activist background, but it is also a call (hacer un llamamiento) to academicians, workers of the cultural and creative fields, social researchers and to social economy processes. The results of this research could be helpful for organizations, social movements, and citizens and, of course, other researches. We are closing the first stage of the project and from now on, through this crowdfunding campaign, we would like to edit a publication where we will systematize the contents and methodologies designed during the last 3 years. This process will also let us keep working under the umbrella of Copylove and keep imagining lines of work that may be useful for the commons. This means, we need to get back to what we produced in order to organise and share it while we discover the next steps to take. As if an archaeologist crawled into a cow's digestion and uploaded everything to the internet under an open licence. From its beginnings, the aim of Copylove is to be applicable to several contexts, far away from the places where it's been activated and from us, the people that started it. Although the research we started on year 2011 has always been open, the expansion of its contents through the use of several methodologies, as well as an endless amount of materials and resources, do not make it easy to replicate it. We have also discovered a great virtue that is also an exciting limitation: Copylove is enormously contextual. That means we need to organize all those materials, in a conceptual and in a functional way, in order to enable an easier application in different contexts. This way, people will not only be able to replicate some methodologies or reproduce some concepts that can already be found online, but also to access to its full code. Not only to get to the what, but also to the how and the why. The vast box of concepts, thoughts, dynamics and situations that we built in Copylove needs not only to be tidied up, but also be converted in a format that makes possible its reinvention in other places, in the hands of whoever wants to activate it. This will enable the invention of new methodologies, rather than the replication of the existing ones; the addition of meanings or the invention of new concepts, rather than the reproduction of the available ones; the mapping out of paths to the same thoughts, to the next thoughts or to the opposite ones, rather than the duplication of the thoughts found here. In conclusion, a publication that allows thinking Copylove from any context, rather than thinking Copylove for a new context. From year 2011 on, many people, collectives and entities have collaborated in this project (Tramallol, Ehcofab, Marina Garcés, Ateneu Candela, Patio Maravillas, Carolina del Olmo, Helvéticas, Women in Black, Taraceas, Marta Malo, Débora Ávila, Etcéteras, Histeriak Kolektiboa, Lakabe, Despacho de Pan, Periódico Diagonal, Carolina León... a list that comprises more than 200 people). The project also had support and funding from ZEMOS98 Festival (we were hosted in the residences of the Centro de las Artes in Sevilla), the Summer Courses of the Universidad Internacional de Andalucía and from Museo Reina Sofía. He took the artist's "full pack": Degree in Fine Arts, postgraduate courses and specialized master in Basque Art. This helped him to understand where he did not want to be. He reoriented his commitment as an artist joining the oficina de ideas AMASTÉ, and eventually (as part of a logical evolution) ColaBoraBora, an island between existing reality and projected desire, where different kinds of actions and processes take place, devoted to the generation of new ways of organizing, producing and relating surrounding common, free and open things. ColaBoraBora focuses on everything related to the commons, collaborative practices, free knowledge, open code and social entrepreneurship. She took her Journalism degree at the Universidad de Sevilla and is member of the coordination team of ZEMOS98 since year 2005. 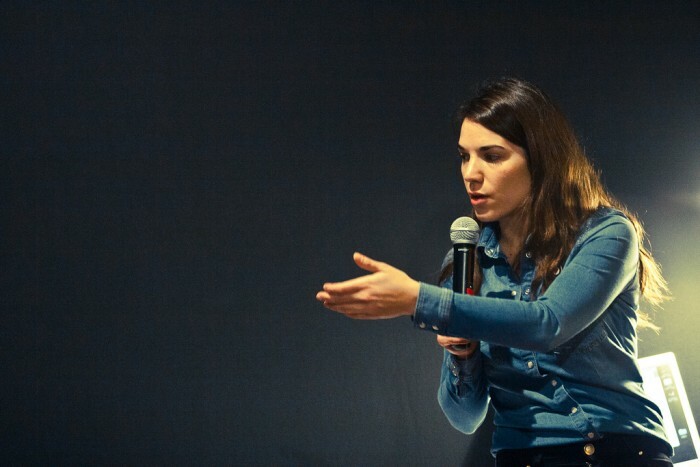 She has taken part in the development, production and communication of projects like Festival ZEMOS98, publishing, cultural research projects and training in seminars, workshops, lectures, exhibitions, talks, courses and projections in several cultural spaces. She has been responsible for the weekly podcast RADIOACTIVOS, a free culture magazine broadcasted at Radiopolis 2007-2011. 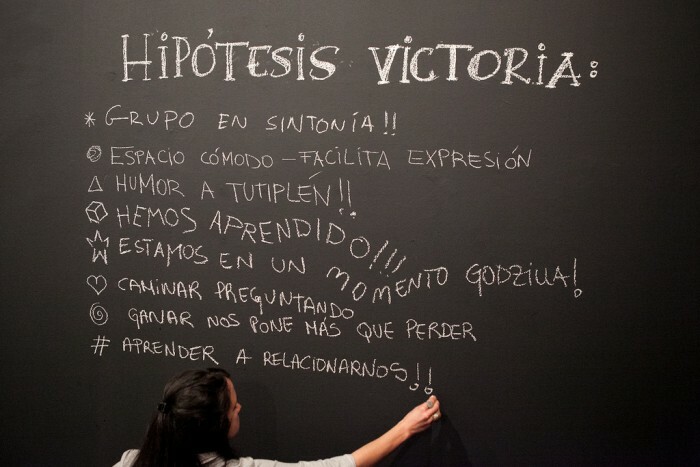 Currently, she coordinates and programmes Festival ZEMOS98 and collaborates with 98lab as a teacher and tutor. 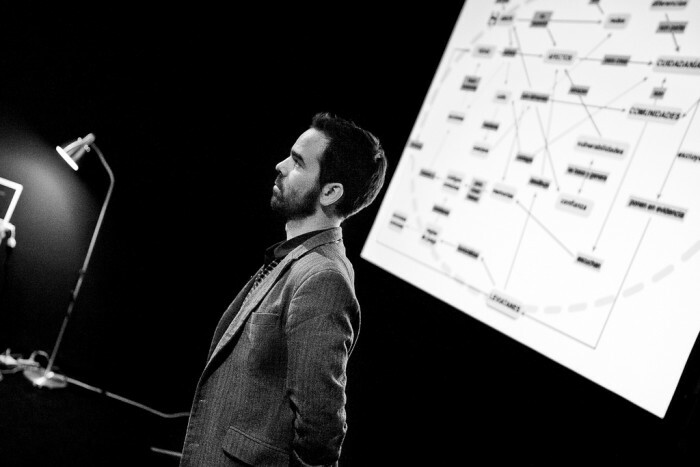 He devotes himself to research and to cultural training and production projects. He is co-founder and member of ZZZINC platform, a cultural I+D lab. 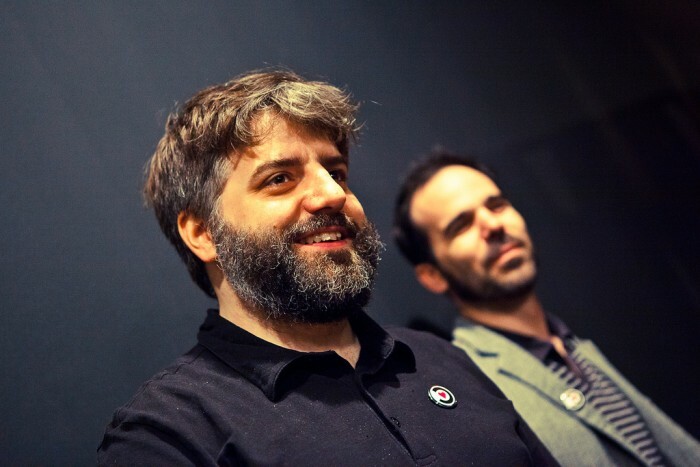 Between years 2002-2011, he founded and co-directed YProductions, a production studio from which several contributions to an economical politics of culture were made. Currently, he writes his doctoral thesis on the articulation of processes of social innovation and promotion of the communitary management at the Department of Political Sciences of the Universidad de Barcelona (UAB). He is a member of the IGOPnet research group (IGOP/UAB). He is trainer/consultant for the degree in Theory of Culture of the UOC. Open format, available as ePub, pdf and printable. Conclusions will be presented online and in the space chosen by UNIA, in order to establish a dialogue with the coordinating people. All work methodologies, useful for other contexts, will be open format and freely available.